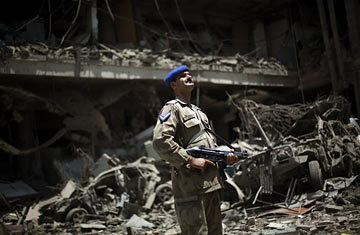 A Pakistani army soldier inspects the debris of the Peshawar Pearl Continental hotel, which was struck by a suicide bomber. The site of the explosion is marked by a 15-foot crater. The devastation wrought all around resembles the aftermath of a wartime aerial assault. Investigators are picking through the rubble that lies all around for clues. Rescuers in the building have been conducting a search of their own, hoping to lift survivors to safety. After hours of rummaging, they locate the body of Kamal Ahmed, the hotel's much-liked general manager. But he is no longer alive, to the despair of his family. According to Mohammed Ali, a Peshawar policeman on the scene, the driver "drove speedily to the left side of the hotel, where there was a car park near the kitchen and the laundry. He stopped there and blew up the vehicle." The attackers' vehicle was vaporized, he adds. In scenes that revive grim memories of last September's attack on the Marriott Hotel in Islamabad (the hotels have the same owner), nearby cars have been crushed and mangled. Then as now, the final moments before the bombing are revealed in CCTV footage shot by cameras mounted around the hotel compound. The brief clip shows a cyclist pull up to the entrance of the hotel compound. After speaking with the guard, the metal barrier is lowered, and the cyclist passes. Three attackers follow inside two white vehicles, a sedan and a small pick-up. The car jerks for a second, then speeds ahead with the pick-up closely tailing it. Moments later, there is a bright flash and the screen trembles, marking the explosion. Like the Marriott, "the PC", as it popularly known, was a choice haunt for politicians, aid workers, and journalists. In the opening days of the war in Afghanistan, many rooms were occupied by western media organizations. At the time, the discreetly located bar  Peshawar's only one  was still open. Some fixtures endured the city's slide in security over recent years as militants have increasingly menaced this bustling northwest city of three million. Spies skulked in the lobby, assiduously rereading newspapers. And there was still "Taipan", the Chinese-ish restaurant looking out at the pool. Half-eaten plates, half-emptied glasses, and cigarettes left to slowly burn themselves out conjure panicked scenes of flight. No group has so far claimed responsibility for the attack, but early suspicions are being cast on the Taliban. Last month, the group owned up to authoring a similarly executed gun and bomb attack on police and intelligence agency offices in Lahore. Vowing revenge for the Pakistan army's punishing month-old assault on its fighters, Taliban commander Hakimullah Mehsud warned of further attacks across the country. Other likely suspects include al-Qaeda. On June 3, a voice believed to be that of Osama Bin Laden's railed against President Barack Obama's administration. Specifically citing the military operation in the Swat Valley, the audiotape broadcast on Al-Jazeera accused Washington of "having planted new seeds to increase hatred for and revenge against America". The Marriott attack is believed to have been orchestrated by Usama al-Kini, a senior al-Qaeda operative who was killed in a drone attack on Jan 1. There is also obvious potential for the two allied militant groups to have collaborated in the attack on the only luxury hotel in al-Qaeda's birthplace. Among the hotel's diners on Tuesday night were 25 United Nations staff assisting the relief effort for the estimated three million people displaced by fighting between Pakistani forces and Taliban fighters in the Swat Valley and two neighboring districts. The UN says that five of their staff were killed by the attack, including Aleksandar Vorkapic, a Serbian national working for UNCHR and Perseveranda So, a Philippines national running education projects for Unicef. Their deaths may now halt some of the UN's extensive operations in Pakistan's northwest. Most of the staff has been sent to Islamabad. Other aid agencies have ruled Peshawar off-limits and are considering their remaining options. Qazi Jamil, a senior Peshawar police official, says that threats have loomed over the city and the PC in particular for some time now. But he and his colleagues are poorly resourced, short-staffed and only now receiving counter-terrorism training. "We have stepped up security, we are trying to block all the entry routes to the city from the militants," he says. "We are doing spot checks in the city and the surrounding rural areas. But we cannot check every single car." He points out the sacrifices that Peshawar's policemen have made in recent years. In the courtyard of his fortified offices is a monument consecrated to the memory of the policemen killed. But the marble structure has also served to deplete morale, with many requesting a transfer out of what has become Pakistan's most dangerous city.